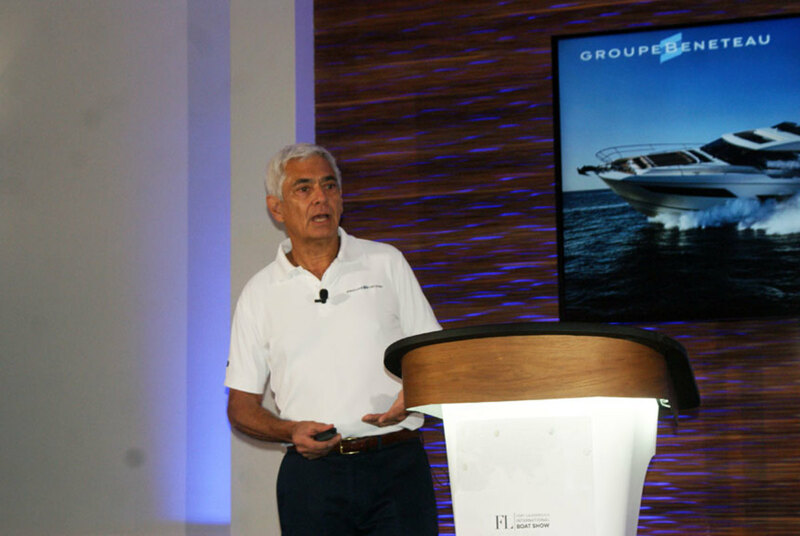 Executives from Groupe Beneteau’s North American division outlined growth plans and talked about new models during a press event at the Fort Lauderdale International Boat Show. George Armendariz, Groupe Beneteau Americas CEO, said the company has been active in creating a boating experience that is “hassle-free and on demand” with the launch of Beneteau Boat Clubs in France for its Beneteau division and a partnership with Freedom Boat Clubs with its Jeanneau division, and their respective dealers. Armendariz declined to say if the club model would be adopted in the North American market. Groupe Beneteau, which builds 10,000 boats annually from 16 to 105 feet, has the “fastest renewal rate” in new-product development across the industry, according to Armendariz. “Forty-four percent of our models in less than three years are new,” he said. “At the same time, with our recent acquisition of Seascape, we’ve re-energized participation in small performance sailboats from 18 to 24 feet. We’ve also launched a new brand of catamarans called Excess for a younger demographic. It is a different vision of sailing.” He said the company would have a “soft launch” of a new model at the Düsseldorf boat show. Groupe Beneteau, which has 20 manufacturing sites in Europe and North America, plans to build more diverse brands on both continents to minimize the costs of exchange rates, shipping and trade policies. The company recently expanded its facility in Ostrada, Poland, and opened a shuttered sportboat plant in Cadillac, Mich. It is building two Jeanneau NC models in Cadillac, with plans to also build the Beneteau Antares outboard lines there. It is in the process of acquiring Delphia Yachts in Poland, which will give it the capacity to build 2,000 more boats a year. Armendariz said that the company has been working with the NMMA to see what type of boat recycling initiatives could be launched in the U.S. market. Jean-Francois Lair, Beneteau America director of sails, said the company has a strong inboard presence in the Untied States, and that it would focus on increasing its outboard range with Antares. That brand has three lines of 21-, 23- and 27-footers that will be imported to North America. The company recently partnered with Mercury Marine as its U.S. outboard supplier. In addition to launching the Swift Trawler 47, the builder has also introduced six new sailboats to the U.S. market. The company has been building sailboats in Marion, S.C., since 1986. Lair said 9,000 boats have been produced in Marion during that time. Production would also increase this year. The company also said it would partner with North Sails in the U.S. market with its 46.1 Oceanis. The imported models include the inboard brands NC, Leader and Velasco, and the outboard brands NC Sport Range and Leader Range. The company introduced a new outboard-powered Leader 30 in the United States this year and plans to launch the NC1095, a 35-footer with outboards. The Prestige motoryacht brand continues to grow, with 14 models across four categories. It launched the Prestige 590 and 460 hardtop at FLIBS this week. Carla Demaria, president of Monte Carlo Yachts, said the company would introduce three new models next year. She said the 10-year-old company, going forward, would launch three models a year as part of an aggressive new-product development schedule. Christophe Lavigne, president of Beneteau’s U.S. brands, spoke about the new Wellcraft 352 and Four Winns 355 Vista on display at FLIBS. “These boats adopt new features that put them ahead of competitors,” Lavigne said.